Since the 16th century, Shinto and Zen Buddhist teachings have reinforced the bond between nature and humankind. This tenet inspired the inclusion of small courtyard gardens (tsuboniwa) in Japanese homes1. These masterpieces of landscape design connect residents and guests with wild nature, provide light and cooling, and offer focus for aesthetic contemplation2. 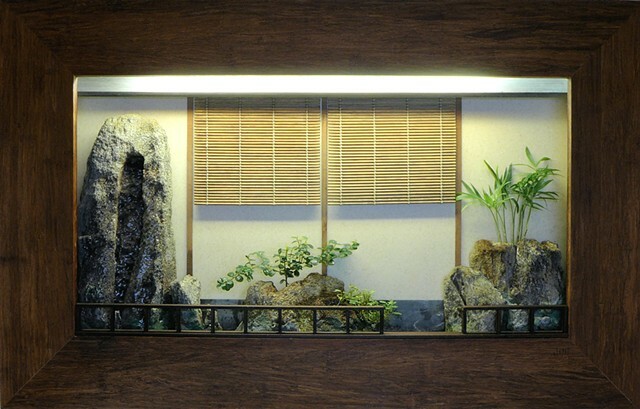 This composition represents a miniature tsuboniwa, blending traditional materials of stone, plants, and wood with modern Corian material, which forms the enclosure of the garden. The frame is reclaimed strand bamboo flooring. A recessed UV lamp accentuates the surface textures and facilitates plant growth, allowing this composition to be located on any wall, irrespective of available sunlight. 1. Locher, M. (2012). Zen Gardens: The Complete Works of Shunmyo Masuno. Tuttle Publishing. pp. 17-18. 2. Mizuno, K. (2006). Courtyard Gardens of Kyoto’s Merchant Houses. Kodansha International. p. viii.